Republican 2016 contender Sen. Marco Rubio pressed for an expansion of vocational education in order for America to compete in the “global economy” while campaigning in Wisconsin Monday ahead of the GOP debate Tuesday evening. The American private sector is going to create not just millions of jobs but millions of better-paying jobs. But better-paying jobs are going to require more skills, which is why the second thing we have to do is we have to modernize what we mean when we say “higher education.” For starters, I do not understand for the life of me why we became a society that told young Americans that trade schools and vocational training are for kids that weren’t smart enough to go to college. The Republican candidate said he would like to see a 16-year-old who wants to become an auto mechanic or machinist go to high school in the morning and then use the Pell Grant to attend trade school in the afternoon. “So that when they’re 18-years-old and they graduate they have a job making fifty or sixty thousand dollars a year,” he said. He stressed, however, that four-year colleges need more competition. Rubio added that students deserve to know how much people make when they graduate from a four-year school before they borrow money to pay for it. “Before you borrow $50,000 you deserve to know that the market for philosophers has tightened over the last two thousand years,” he said. Rubio continues to criticize the federal government’s involvement in K-12 education. “There is no reason for the federal government to be involved in K-12 education through Common Core,” he said. 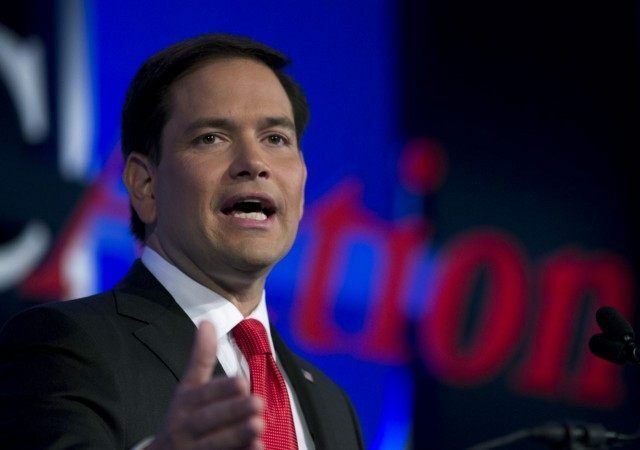 Recently, however, Rubio received the endorsement of billionaire Paul Singer, a supporter of Common Core and a donor, through his foundation, to Jeb Bush’s Foundation for Excellence in Education, a pro-Common Core nonprofit. Singer has also been very active in LGBT equality efforts. In August, Rubio earned a grade of “C” on The Pulse 2016’s Common Core Report Card. It is hard to parse…what the education policies would look like under a Rubio Administration. What does Rubio believe would validate a student as “work ready”? Would it be the further alignment of our K-12 education system to the projected demands of specific sectors of the economy to train workers for favored big businesses, which would mean more of the Chamber of Commerce-endorsed Common Core? Or, does it mean aligning education to the demands of parents and the local community as a whole, which would mean more local control? McGroarty also observed that while Rubio voted against Sen. Lamar Alexander’s bill to reauthorize No Child Left Behind, he failed to vote on Sen. Mike Lee’s amendment that addressed the right of parents to opt their children out of standardized tests. Additionally, he co-sponsored the Student Right to Know Before You Go Act, a measure that “would create a federal database on students for at least 15 years after they enter the workforce,” states McGroarty. “It is troubling that Rubio advocates a limited role for government in the activities of the American people, yet fails to see the problem with the governmental tracking and collecting data on all citizens,” he adds.